I just came back from our bar association's annual Law Day lunch. Al Franken was the speaker and is running against Norm Coleman for the Senate in Minnesota. I had the chance to talk to him afterwords and told him that if he wins, I will work for his office on health care issues for free. I have his card. I hope he wins. You would enjoy it, and help the country at the same time. I heard Al when he was campaigning for Kerry last election - gave a speech here in Tampa. He is very smart and has spent months visiting the troops in the mideast. Seems to be very "patriotic" in that he really loves this country and its core values. On a few occasions, including a recent Letterman visit, he seems to be struggling to jettison the comedian content. Taken out of context (as it will be in the election) some of the things he allegedly said are outrageous. In context, they are simply hysterical. It will be interesting to see how he plays it out. I will work for his office on health care issues for free. I have his card. You would jump right into the big one, eh? Hope he wins, and good luck. For the record, I'd never vote for Al Franken. Not because of his politics, but simply because is very ugly and smelly. His breath is a combination of hot garbage and rotted fish (rotted carp, specifically). He also has a gigantic nose and he burps alot. His burps smell like spoiled cabbage and old hot dogs. He is very ugly too. The pores on his bloated, fat, ugly face are so big, it looks like his face was used as a dart board by the entire Irish Republican Army. Speaking of blemishes, Al Franken has blackheads on his face and back that are older than me! He has so many pimples that every time he smiles, a little bit of puss comes out of his face. Yuck!! He was really beaten by the ugly stick. And those glasses - they are so thick! he actually gets his prescription from pre-WW1 coke bottle bottoms! Did you know htat he suffers from severe depression? He gets depressed everytime he looks in the mirror. The man is a goblin! Did I mention he is ugly? PS- For the comedy challenged: the post above was satire. I really don't hate Al Franken. 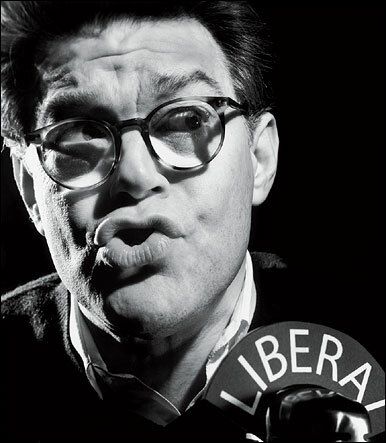 I actually think that Al Franken is quite hilarious. I was merely using his own techniques that he has perfected in his books "Rush Limbaugh is a Big Fat idiot" and "Lies and Lying Liars that tell them" against him. Interesting to hear all your comments. Minnesota is a special case. Our right is most other states' left. Don't follow politics that much anymore - but I suspect Al is way way too far to the right for this old SW Washington Democrat. heh heh heh - just kidding. Although I would for for for Edwin if the Fed's would let him run from prison. WoW he got 12.6 % of the vote..
Al Franken used to tell a true funny story about how at one dinner, a scientist took him aside and told him me was involved in research about some disease or conditions that makes your head and hands very large, and that he thought that Franken had that. I'm impressed by him, and hope that if he wins, he will add the comedy stuff back into his speeches. Ruh-roh-- are you implying that the White House hasn't already done that?!? i visited minnesota once and was so surprised how liberal the state is - and just about the nicest people i ever met too! oh yah! It is a very interesting state, particularly if you go back a ways and see how the farmers organized to confront the old agra-business system that picked their pockets and bankrupted their farms. There is a reason why they are who they are. Al is no where near as ugly and vitriolic as Rush. I think Al is a breath of fresh air compared to the hypocrites and cowards (aka, those folks who would commit others to fight a war where their own families are not in the line of fire) in the current administration. I shall now get off my wooden apple box. "Al is no where near as ugly and vitriolic as Rush. I think Al is a breath of fresh air compared to the hypocrites and cowards (aka, those folks who would commit others to fight a war where their own families are not in the line of fire) in the current administration." Credit Alex for my response. It doesn't take much for me to get fired up about the current administration and their #*#!*s... I'm not right or left, just mad!
. . . I had the chance to talk to him afterwords and told him that if he wins, I will work for his office on health care issues for free. I have his card. Now I have another reason why I hope he wins.